With San Diego Comic Con 2015 right around the corner, tons of information is beginning to flow regarding all the various exclusives and future toy announcements. This one totally slipped under the radar – unless you’re a fan of The Loyal Subjects and their vinyl figures that they’ve been pumping out! This here is our first look at an upcoming ToyTokyo.com exclusive – a translucent Mighty Morphin Green Ranger vinyl figure from The Loyal Subjects! Whether this is an exclusive at San Diego Comic Con 2015 with Toy Tokyo or an online exclusive is unknown to us at this exact moment – but the figure sure does look awesome in translucent green! 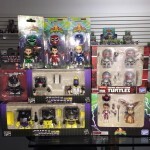 Also pictured are the first in-package shots of the upcoming San Diego Comic Con 2015 exclusives from The Loyal Subjects – including the translucent Mighty Morphin Red Ranger, translucent Mighty Morphin Blue Ranger, and the metallic version of the Mighty Morphin Pink Ranger vs Rita Repulsa set! Sound off in discussion! How bad do you want these awesome figures? All I know is … we want them! !